Shizuo “Bob” Takashige was born in September 1916 in Honolulu, Hawaii. He joined the 298th Infantry of the Hawaii National Guard and later became an original member of the 100th Infantry Battalion. He was assigned to Company B, 3rd Platoon. At Camp McCoy, this platoon was selected for a secret assignment on Cat Island in the Gulf of Mexico where the soldiers acted as dog bait in a failed experiment to see if dogs would attack them based on their supposed unique Japanese scent. If successful, dogs would be trained and sent to the Pacific war zone. Wounded from a “tree burst” in Italy, Takashige continued in combat until France. 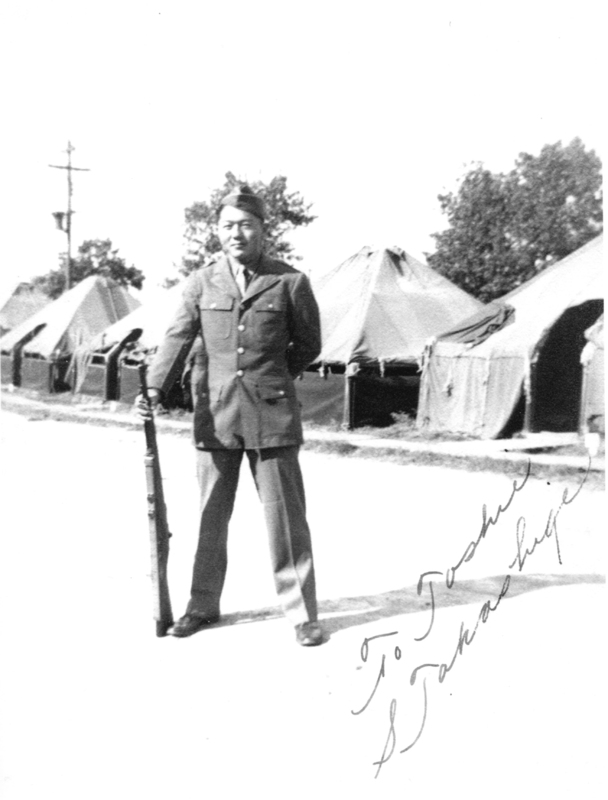 After the 100th/442nd defeated German forces and took the town of Bruyeres, he contracted what he termed “frozen feet.” (Trench foot was a common and painful condition among the Nisei soldiers.) The cold and wet weather caused his feet to swell, and he lost all feeling in each foot. While in the hospital, he also had shrapnel and wood splinters removed from his back due to the “tree burst” wound he had gotten in Italy. After he recovered, he was sent home to Hawaii and discharged from the army. Takashige related that when he applied for a loan from Bishop Bank to start a business in Hawaiian shirts, he was denied because of a lack of collateral. However, he learned shortly thereafter that a haole soldier who had also recently been discharged had gotten a loan without providing collateral. He concluded prejudice and racism was still practiced in Hawaii even after the achievements of the Nisei soldiers in the war. He realized that without any representation in state and federal government such discriminatory practices would still continue.